Nykaa Paintstix! Boss Babe 14 : Nothing can equal the power of a bold pink lips! A swipe of our Nykaa Paintstix! Lip Crayon in Boss Babe and you are set to take on the day! As they say, give a girl the right lip shade and watch her conquer the world. 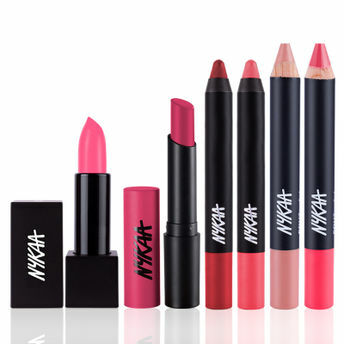 Nykaa Matteilicious lip crayon - Pink On Fleek : Disturb the peace and bring the roof down with the Nykaa Matteilicious Lip Crayon in Pink On Fleek. This lovely pink shade is sure to kick up the fun factor. Sit back and enjoy the ride with the bubbly shade. Why Should You Make It Yours: Nykaa Matteilicious Lip Crayons is the perfect way to get that gorgeous matte pout! This cruelty-free, and high-pigment formula gives you an intense matte finish that lasts for hours without fading or feathering! The unique formulation ensures that your lips stay comfortable, colored up and matte-smooth all day long! Bonus: These vivid, full-coverage hues are hand-selected and named by our In-house Nykaa Panel to ensure your lips look as gorgeous as you! Also, these babies will ensure you look fabulous without breaking the bank. Go ahead, grab em' all!